"A Concert in the Park" at Michigan State University, April 28, 2016. 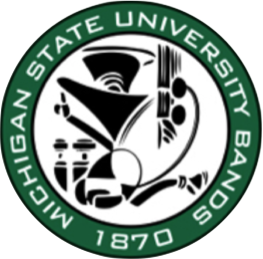 Doug Brown took Wind & Rhythm "on the road" and visited Michigan State University to host a live production of the show. In partnership with Director of Bands Dr. Kevin Sedatole and the MSU Wind Symphony, "A Concert in the Park" was created to reimagine how a wind band, a live audience, and a radio program can bring about a musical experience like no other. Doug was the Master of Ceremonies, setting the stage (so to speak) for each piece, interviewing members of the band, and guiding the audience through a night of magical performances. John Williams is one of America's most well known conductors, composers, and pianists. In a career spanning over six decades, he has composed some of the most recognizable film scores in cinematic history including the Star Wars saga, Jaws, Superman, the Indiana Jones films, E.T., Home Alone, Hook, Jurassic Park, Schindler's List, Saving Private Ryan, War Horse, and the first three Harry Potter films. Other notable works by Williams include theme music for four Olympic Games, NBC Sunday Night Football, the NBC Nightly News, the Statue of Liberty's rededication, and the television series Lost in Space and Land of the Giants. Williams has also composed numerous classical concerti. He served as the Boston Pops Orchestra's principal conductor from 1980 to 1993 and is now the orchestra's conductor laureate. Williams has won five Academy Awards, four Golden Globe Awards, seven British Academy Film Awards, and 21 Grammy Awards. John Williams was honored with the prestigious Richard Kirk award at the 1999 BMI Film and TV Awards which is given annually to a composer who has made significant contributions to film and television music. Williams was inducted into the Hollywood Bowl Hall of Fame in 2000, and was a recipient of the Kennedy Center Honors in 2004. ​The 1996 Summer Games of the XXVI Olympiad, held in Atlanta, marked the centennial of the modern Olympic Games as conceived by Baron Pierre de Couberin. John Williams wrote Summon The Heroes as the official theme of the Olympiad. The five musical sections of the composition relate the progression of events, physical efforts, and emotional feelings that mark such an important competition. A heroic brass Fanfare marks the official opening ceremonies. The significance of each athlete’s long training and sacrifice is acknowledged in a solemn Prologue played by a solo trumpet. Williams dedicated this composition to Tim Morrison, principal trumpet of the Boston Pops Orchestra. The ensemble enters with excitement as the Flags introduce the athletes of the many nations. The Contest starts softly as the athlete collects thoughts and inner strength and enters the struggle of the competition accompanied by the cheering of the spectators. Finally, the majestic Parade presents the heroes of the events. Morton Gould exhibited signs of musical talent at a very early age. He began to play the piano when he was four years old, published a composition at the age of six, and was engaged to play piano over radio station WOR when he was seven. He was only 18 when he joined the musical staff of the Radio City Music Hall. By 1942, Gould’s music had been conducted by Leopold Stokowski, Fritz Reiner, Sir John Barbirolli, and Artur Rodzinski. Gould’s preeminent stature as a composer of wind music is due not only to the excellence of his works, but also to his early pioneering and promotion of the American band as a legitimate and viable performance medium. He has appeared in both the United States and Europe as guest conductor, composer, and soloist. His other works for band include West Point Symphony, Derivations for Clarinet and Band, Saint Lawrence Suite, Prisms, Mini Suite, American Salute, Jericho Rhapsody, Holiday Music, and Santa Fe Saga. ​Gould’s Ballad for Band is a one movement work in ABA form featuring slow and lyrical first and third sections that are contrasted by a faster middle section. The piece has many examples of beautifully scored ninth and thirteenth chords. Gould wrote the composition in 1946, and was premiered by the Goldman Band in the same year. Robert Russell Bennett was one of America’s most capable composers and arrangers. A native of Kansas City, he studied harmony and counterpoint with Carl Busch from 1909 to 1913. By 1917 he was composing and arranging in New York and from 1918 to 1919 he served as a United States Army Band Director. In 1926 Bennett began a six-year period of study in Europe, which included lessons with Nadia Boulanger, one of the twentieth century’s most influential composition teachers. From 1936 to 1940 he lived in Hollywood and wrote more than 30 film scores. An avid arranger, Bennett scored more than 300 Broadway shows in his lifetime. During his most successful season, he had more than 22 shows running concurrently in New York. He arranged music for such artists as Irvin Berlin, George Gershwin, Jerome Kern, Frederick Loewe, Cole Porter, and many others. ​Symphonic Songs was commissioned by the Kappa Kappa Psi Band Fraternity and premiered by the National Intercollegiate Band at the 1957 National Convention in Salt Lake City, Utah. Each movement of Symphonic Songs is a remarkable display of Bennett’s scoring, humor, and creativity. The Serenade, which bears little resemblance to that of a Mozart Serenade, has a humorous American style that utilizes cross-accents to keep the listener off balance. The Spiritual provides a blues-like background for solos. The Celebration recalls an old-time county fair with cheering throngs, a circus act or two, and the inevitable mule race. The man who would become known as “The March King” was born in Washington, D.C. to a Portuguese father, who earlier that year had enlisted in the United States Marine Band, and a German mother. John Philip Sousa began formal musical instruction in 1860 at the age of six and appeared as a violin solo- ist by the time he was 11. Two years later, he began his career in the U.S. Marine Band, serving as an apprentice to receive instruction “in the trade or mystery of a musician.” He became leader of the Marine Band in 1880 and served in that position until 1892, when he resigned to organize a band of his own. Along with his ability to organize and conduct superb musicians, Sousa developed a distinct flair for writing marches. He was a prolific composer who found themes for his compositions in his country’s history, dedication events, military groups, and even newspaper contests. Before his death at the age of 78, Sousa composed 136 marches, 15 operettas, 70 songs, 11 waltzes, and a wide variety of incidental works. His most famous march, The Stars and Stripes Forever, has been designated as the official march of the United States. ​The Glory of the Yankee Navy was Sousa’s 70th march, and the only one he wrote in 1909. Unlike his other marches, this The Glory of the Yankee Navy and The Fairest of the Fair (Sousa’s only march of 1908) Frederick Fennell notes that, “the scorings fit with charm the Band’s newly-acquired sit-down acoustical surroundings where Sousa’s simple and appealing tunes found their happiest possible reception.” All totaled, Sousa wrote six marches with titles relating to the U.S. Navy and five for the Marine Corps. Born in Munich on June 23, 1927, Rolf Wilhelm began taking piano lessons at the age of seven. Following his high school education in Munich and Vienna, he received special permission to enter the Vienna Music Academy at the age of 15. There he studied piano with Grete Hinterhofer and music theory with Joseph Marx, studies that were soon interrupted by compulsory military service and internment as a prisoner of war. Released in 1945, he returned to the Munich Academy of Music to study composition with Joseph Haas and conducting with Heinrich Knappe; he went onto receive his diploma in 1948. His first original composition, for radio Munich in 1946, led to further commissions for music for radio plays and serials. Since 1946 Wilhelm has worked as a free-lance composer and conductor. Rolf writes about the piece: "It was my desire to write an easily understood, uncomplicated and jolly work for this fascinating instrument with an enormous range of four octaves and so many expressive possibilities. The second movement in particular proves how lyrical and eloquent the tuba can be." The Concertino was composed at the request of Robert Tucci, who gave the work its first performance during the 1983 International Euphonium and Tuba Conference at the University of Maryland, accompanied by the United States Air Force Band under the direction of Colonel Arnald D. Gabriel. Joe LeFevre simply wanted to be the class clown when he began playing the tuba in 5th grade. Although he’s still a clown, the tuba has become more than a joke for Joe. Joe is a double major in Tuba Performance and Music Education at Michigan State University. He studies with Phil Sinder at MSU and has studied with Bill Short, Dr. Deanna Swoboda, Dr. Jacob Cameron, and Robert Whaley. Joe has soloed with groups including the Kalamazoo Symphony Orchestra and the Civic Orchestra of Chicago and was a national winner of the 25th Yamaha Young Performing Artist Series. In 2014, Joe won the Gold Medal in the Student Division at the Leonard Falcone International Euphonium and Tuba Festival and the Bronze Medal in the Artist Division the following year. Joe currently holds an Associate Membership with the Civic Orchestra of Chicago and has subbed in groups including the Civic Orchestra of Chicago and the Chicago Symphony Orchestra Brass Ensemble. Joe was a winner or alternate in 7 summer orchestral programs, including winning the principal tuba position with the National Repertory Orchestra and the tuba fellowship at the Tanglewood Music Center. Joe will be attending Tanglewood this summer (2016). Andreas Makris (1930-2005) was born in Salonika, Greece. He studied violin at Greece’s National Conservatory and moved to the U.S. in 1950, where he continued his studies at Phillips University in Enid, Oklahoma. He also studied at the Kansas City Conservatory in Missouri and the Mannes College of Music in New York, graduating in 1956. His additional training was at the Aspen Music Festival and the Fontainebleau School in France, where he studied composition with Nadia Boulanger. Mr. Makris played violin with the Dallas Symphony, the St. Louis Symphony, and the National Symphony Orchestra, where he stayed until his retirement for twenty-eight years, collaborating with NSO’s music directors Howard Mitchell, Antal Dorati, Mstislav Rostropovich, and Leonard Slatkin. During his time at NSO, the orchestra performed many of his compositions and in 1970 Mr. Makris became the first contemporary composer to have his work premiered at the Kennedy Center. He served as NSO’s Composer in Residence from 1979 to 1989. He also received several grants and awards for his compositions, including a National Endowment for the Arts grant and an ASCAP Award. Upon his retirement from the NSO, Mr. Makris rededicated himself to composing. His total legacy comprises nearly one hundred original compositions and arrangements. Aegean Festival Overture was written in 1967 as an orchestral overture for the National Symphony Orchestra and was premiered by that group under Howard Mitchell a year later at Constitution Hall. Its immediate success then and on the tour that followed, prompted the collaboration between Mr. Makris and Major Albert Bader of the United States Air Force Band in Washington, DC to arrange the overture as a concert piece for band. It was premiered by the USAF Band under the direction of Colonel Arnald Gabriel, and subsequently published in 1970. ​From its first hammering dotted eighth note rhythms, the Aegean Festival Overture reflects the Greek origins of its composer, who was born in Salonika, a colorful Aegean seaport. The driving energy of the fast section with its restless fives and sevens, and the lyric plaintiveness of the contrasting middle section, all molded into a symphonic form, epitomize the musical style of Makris – a blend of classic form and Greek folkloristic elements.